Deeda Seed Spokeswoman for SLC Mayor Rocky Anderson was fired Friday after 1 1/2 years on the job. Rocky Anderson's spokeswoman has now become his detractor. On Friday, the Salt Lake City mayor fired Deeda Seed, a former city councilwoman who worked as his spokeswoman for about 1 1/2 years and previously worked on his re-election campaign. Before that she was his chief of staff. On Sunday, Anderson said he wouldn't go into the details of why he ousted Seed but said he was unhappy with her work. "We offered Deeda a wonderful opportunity," he said. "I'm very sorry that it didn't work out. I wish her the best." Seed said she was on the verge of quitting anyway because of what she describes as a hostile work environment. She described the mayor as "abusive" and a "terrible boss." "We have to sit there and listen to him berate us, degrade us, degrade other people," Seed said Sunday. "He regularly uses foul and derogatory language with regard to people who disagree with him. . . . He is ineffective and creates a hostile environment." Also on Friday, the mayor's longtime office assistant, Christy Cordwell, quit. Reached Sunday, Cordwell, who has worked for the mayor since 2001, declined to comment about why, though she did say she planned to seek an attorney's advice on her work situation. Anderson denied that he is abusive and said Seed was lashing out because she was fired. "Anytime anybody's terminated they're going to feel like they were misused and abused. She has an agenda. She's hurting, and she wants to hurt me back." It came to a head Friday. Seed said she informed Anderson she was searching for another job after he "blew up" at her over the release of public records about responses to last week's protest of President Bush. He then fired her. Sam Guevara, the mayor's chief of staff, said he and the mayor had been "talking about a replacement [for Seed] for months." Guevara also said he wouldn't describe the environment in the mayor's office as "hostile" and said he hasn't witnessed the mayor bawling out others. "He's never yelled at me. I've always had the attitude [that] it's a tough job. There's a lot going on here; you just have to keep up with it." But Cordwell said she's complained to Guevara about how the mayor treats employees. And she said she's witnessed the mayor "berate" Seed. "I know that Sam has seen it. I have personally seen it myself many times. I've seen him pound the desk, scream, come out of his chair like he's going to come right over the desk to her," Cordwell said. Seed said the mayor has called her "stupid" in front of others and has screamed at her. Anderson said he has had to "talk to her on occasion, sometimes when I was very frustrated about her not getting the work done or doing it very sloppily. That is not a hostile work environment, trying to make sure the job's getting done well and everybody's pulling their weight." But Seed said she thinks she's done a good job and noted the national award the city won for the Bridging the Religious Divide project, of which she has been in charge. Seed says the mayor privately belittles City Council members - with whom he has had a number of high-profile disputes - and "makes fun of LDS . He's a religious bigot." Anderson called such allegations regarding the LDS Church "outrageous," accusing Seed of trying to drive a wedge between him and the church. The mayor denied making fun of LDS beliefs, but said he has discussed why he is no longer Mormon. "Some of them are theological issues. Deeda's always been far more extreme in discussing those issues. I, as well as just about everybody, understand that we've got to respect those beliefs." As for the council, his disdain is no secret. "Have I used profanity talking about council members at times? Absolutely," the mayor acknowledged. He noted he's on a "self-improvement program" to cut down on cussing. Seed has had a long history with city politics. She represented Central City on the Salt Lake City Council from 1996 to 2000. 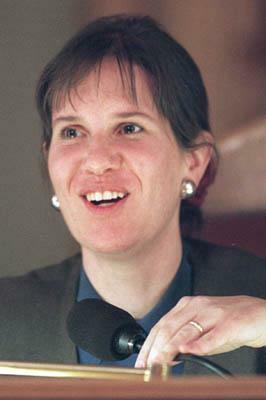 While Seed worked on the campaign of Anderson's opponent during the 1999 mayoral election, the mayor hired her in 2000 to head up the city's Housing and Neighborhood Development division. He quickly promoted her to chief of staff. She left that post in 2001. Her relationship with the mayor was strained then. But when she quit, Seed and the mayor were cordial. Two years later, Seed worked as a paid adviser on Anderson's 2003 re-election campaign and was hired as his spokeswoman in April 2004. She said Sunday she returned to work for Anderson because she needed a job and noted she is a "policy wonk" who enjoys working on urban issues. Beyond acting as Anderson's spokeswoman, Seed worked on key projects like Bridging the Religious Divide, the citywide book club and Anderson's Freedom Forums. Seed noted she agrees with many of the mayor's positions, such as extending domestic-partner benefits, expanding mass transit and creating walkable neighborhoods. "It's his complete lack of ability to deal with human beings I have a problem with," she said. "Stylistically, he's just a disaster." Seed also described Anderson as "bored" with being mayor. Anderson has stepped out on what are traditionally viewed as national issues, including environmental work and protesting the president. "He's said he's bored. He's said he's not using his full intellectual capacity as mayor," she said. Anderson said he is "absolutely not" bored. "I love being mayor." Anderson - who hasn't decided whether to seek a third term - has said he wants to work on human rights issues when he is out of office. Seed scoffed at the idea. "He doesn't have the capacity to be empathetic," she said. "He cares about Sudanese refugees. When it comes to people in his life on a daily basis, he says he cares but his actions don't demonstrate any kind of real caring." Gwen Springmeyer works in community affairs for the mayor. She said Sunday the mayor has always treated her with respect. "Mayor Anderson is never rude to me. He never berates me. He doesn't belittle me. I intend to stay until the end of his term." Anderson's first term as mayor was marked by high turnover and his managerial style was an issue in his re-election campaign. There was some turnover after his re-election, but employment in the mayor's office had remained relatively stable. Salt Lake City Mayor Rocky Anderson has replaced spokeswoman Deeda Seed with Clifford Lyon. Lyon helped found Rhythms of Life, a nonprofit that promotes noncompetitive play for youths. He's a board member of the Human Rights Education Center of Utah, which teaches young people "anti-bias, nonviolence and peacemaking education," according to its Web site. He was the chief operations officer of The Lyon Co., a national gift wholesale distributor. Lyon is also the former brother-in-law of Anderson's girlfriend, Tracy Lyon. "That's not how I met him," said Anderson, who said he met Clifford Lyon through his new spokesman's youth programs. "I've always admired his tenacity and his passion on the issues. I also am thrilled that he's a very good writer." Phil Riesen November 1999 to February 2000; fired. Dave Owen February 2000 to March 2000; resigned. Ted Nguyen May 2000 to August 2000; quit. Josh Ewing December 2000 to February 2004; quit. David Jones February 2004 to April 2004; quit. Deeda Seed April 2004 to August 2005; fired.